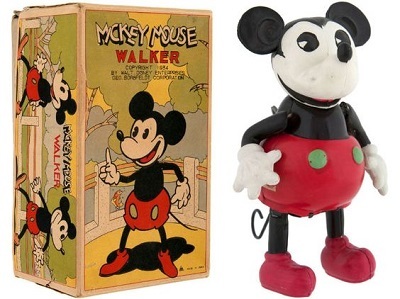 This article will be going over some of the rare Disney Collectibles and their what their values would be. 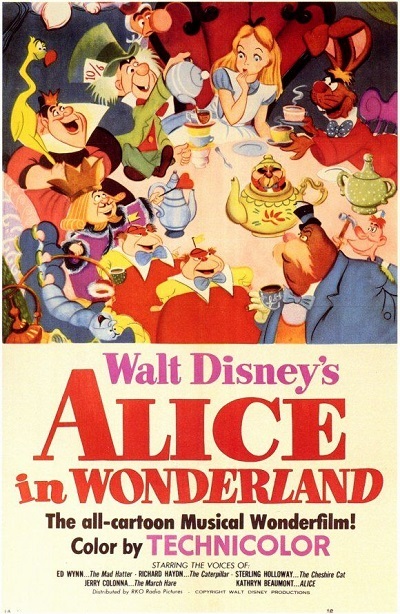 When the Disney movies first came out, they would use multiple posters to promote the movie or short film. Each poster variant could have a different scene from the movie. Or even simply have names of the people involved in the production and the writing added or removed. These differences are listed as styles, such as Style A or Style B. Not every style has value, some could have been limited prints or others linked to a specific screening. 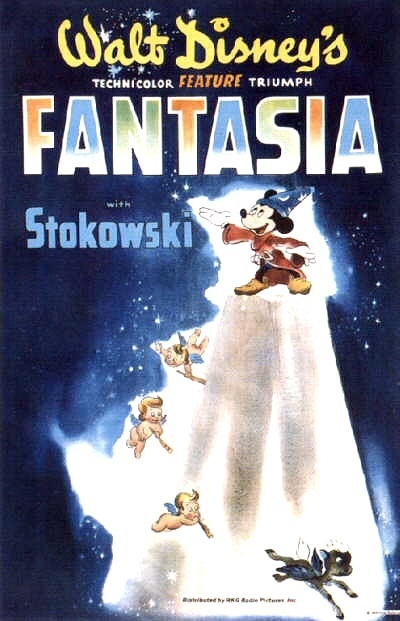 Style B included composer Leoplod Stokowski’s name as part of the promotional material. Considered one of the best earlier films containing Donald Duck. 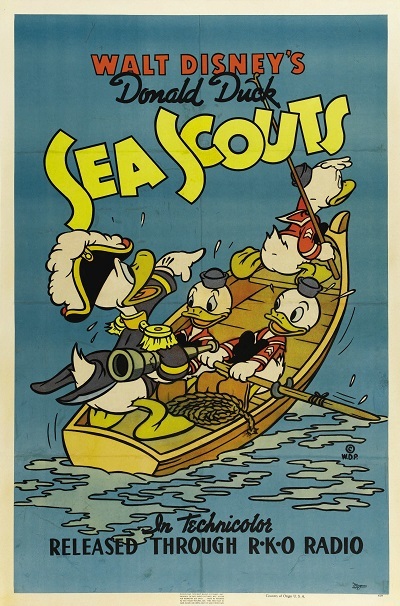 This poster is highly sought after by fans of Donald and his three nephews, Huey, Dewey and Louie. Boasting some of Disney’s most twisted and serial images, this beloved classic has granted us some of the most memorable characters. From the Mad Hatter to the Cheshire Cat and the Queen of Hearts, these iconic characters have helped to make this movie a memorable classic. Despite its lukewarm reception upon release, this retelling of Lewis Carroll’s classic English literature, has grown a cult following. Often considered to be Disney’s most iconic couple. Items that either consist of the two together or are a paired set can be highly sort after. Ranging from plushy’s to tin toys and badges. 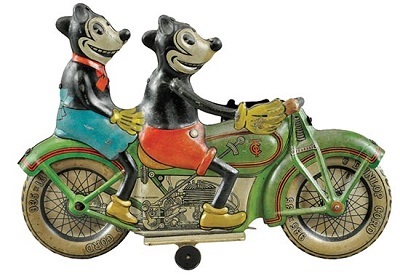 This piece is the most desirable German toy from its time period due to its cross over appeal with motorcycle collectors and Mickey and Minnie fans. This little windup toy originally sold for $1.00. It was credited with saving the Lionel Manufacturing Company from bankruptcy during the great depression. Standing at an impressive 30″x 40.75″ and 28.75″ x 42″ respectively. These mechanical window displays are not only hard to find as a pair, but its even rarer to find both in functional condition. Several styles of money tins, piggy banks and cash boxes have been produced over the years. Some designs were a simple printed tin with a coin slot located at the top. Many of these tins did not have a way to remove the money once its full and had to be destroyed, damaged or broken in order to get the money out. Other designs implemented a simple mechanical mechanism that either used a coin slider or leaver to drop the coins into the box. These money banks encouraged kids to save more money, by making it fun for the kids to put money into them. Kids found it fun to pull Mickey’s right ear to make his tongue stick out. Placing a coin on his tongue they would then push it into his mouth and he would swallow the coin. 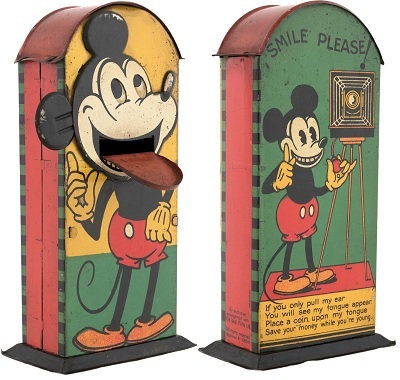 Mickey’s eyes would also look up when his tongue was out, and look down when his tongue was in. A mint working condition unit would fetch the highest possible price. 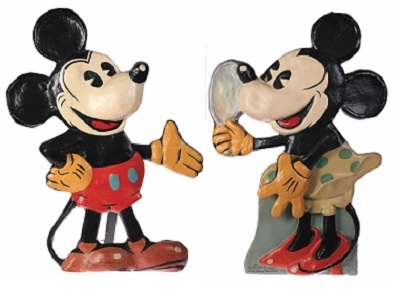 Many of the earlier toys produced for Disney were made from tin and lithograph stenciled. Many of these designs included basic movements such as a waddle walk or rotating wheels. Some toys have lasted the years with their mechanisms intact while others haven’t been as fortunate. Working condition toys will be worth more then their lower counterparts with broken springs. Minnie Mouse dances and twirls on top of the organ, while Mickey cranks the organ. This piece is an excellent example of how much a mint condition unit can felt in comparison to a poorly cared for unit. Estimated Price: $19,000 USD pending on condition and original boxing. 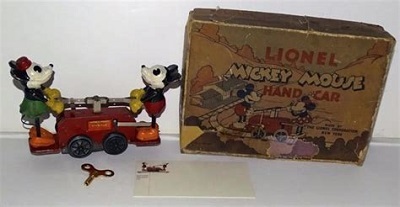 This toy would prop itself up with its tail allowing it to stand while it was stationary. The arms and legs would move as part of its walking animation. Estimated Price: $500 – $7,000 USD pending condition. This duo are another fan favorite when it comes to iconic pairs in the Disney franchises. 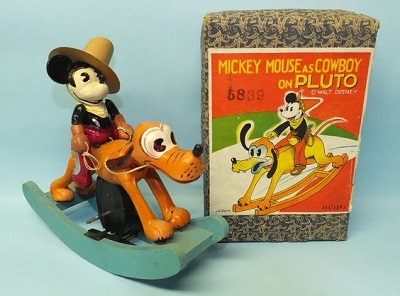 Always his faithful companion, Pluto can be seen here filling the role of faithful steed, as 3 wheels would move and rock them back and forth as the key wind unwound. 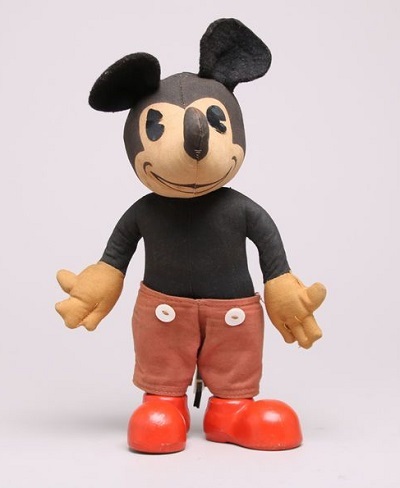 The classic stuffed toy can be a highly sort after item by many collectors. If a plush toy has managed to last long enough being protected from the elements and pests and the children themselves. 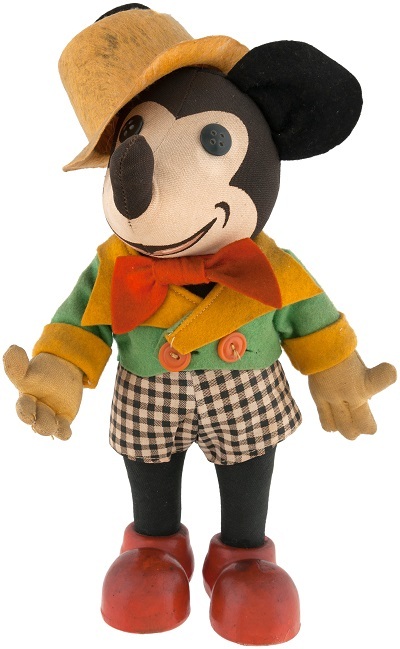 Mint condition plushies are extremely rare collectibles, Disney or otherwise. If you are fortunate enough to have one it just might fetch a high price. Being one of the first plushy dolls to be produced has made this item a highly sort after collectible. With near mint condition units selling for high prices. Sold during the Easter of 1936 as a limited release. The limited number produced as well as the usual factors that make items rare over time. Has made this item a highly sort after collectible.